On January 15th, 2016, I will begin an epic cycling trip through 10 African countries. 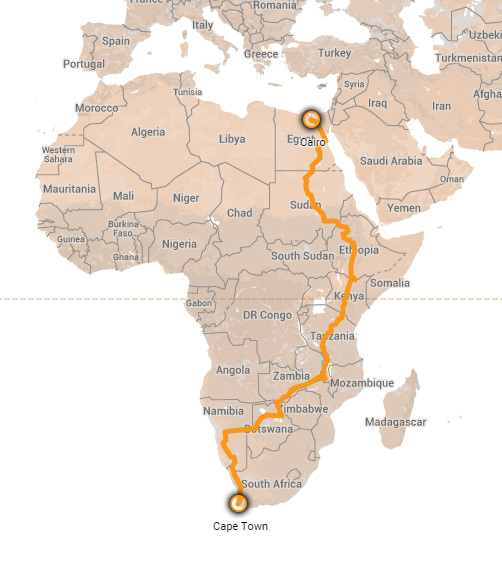 From Cairo to Cape Town the trip will cover 12,076 Km (7,500 miles). It will be a true test of mind, body and bicycle for 121 days. Some say I’m nutty, but I see it as a great opportunity to learn about different cultures, meet some extraordinary people and see Africa at a pace and perspective that few people would ever get to enjoy. You can learn about the entire trip at the TDA Global Cycling web site, as they are the tour operators. If you want to know where we are from day to day, here is a complete itinerary. This exploit through Africa will also allow me to raise money for two very worthwhile charities that are near and dear to my heart. Best wishes on your ride. Will follow you allow the way. I live in on the Gold Coast, Brisbane, hope you have a great time! You must come down to the Gold Coast! Eat lots of food in Breaabodch and go shopping at Robina Town Centre, they are amazing! thanks for this video! I really hope to see you soon again here in Italy! Next time no business only a bike trip and a good restaurant! I wish you a very special Xmas and a Happy new year! happy holidays and best of luck in new year! I was thinking a charity golf tourney might offer a slightly safer method of achieving some of your goals, I know we would feel better about your generous soul! Our thoughts and prayers for you and the group. I may have a slight chance of whoopin you on the golf course next summer as you may not be swinging a golf club for a while! Good luck Hobie! Thanks Mayda and Flip. Appreciate the support. "I agree it looks stupid, so how is it any different from the stupid and sarcastic suggestion that we give really big increases in minimum wage?It is a parallel argument, not?Nuo&;qo.It is not sarcasm, it's a reductio ad absurdum. You are nuts! I traveled a small part of your route and the challenge you are taking on is monumental. The pay off, if you make it, will be a big accomplishment for you and a big boost for the causes that you are supporting. I’m in for $1 (a mile) you can allocate it to the charities any way you want. Wow, Mike, you are really doing this! And I am sure, with your will, determination and strength, you will do it GREAT! And I promise to look after Mary! The word is &#87t6;s1agging— that you need to accomplish and this is what sells a home in a competive market. Color or not, a home needs to be stagged. Meaning, clean all the extras, and anything too personal like trophies, postures… What the pro’s (staggers) is after they have take all excess things out they put out plants in and fresh flowers. Also if you really are worried about paint I would suggest on the MLS (listing) offering an allowance for paint offered to the new owners after closing. I hope this helps! Thanks Jodi & Derb. Merry Christmas and a healthy and happy New year to all the Derbs. Hello! It;812#7&s my first time to visit your webpage. And i love it. Enjoy your theme and the quality of every content to have it here. Fresh and new ideas and thoughts. Thanks for sharing your quality of time and effort for making this. Mike – what a fantastic adventure!! Will be following you with great interest and wish you the very best of luck, may the cycling gods be with you! Thanks Marcus. I heard it’s all downhill and the wind is always behind you on this trip. Merry Christmas to you Tina and the family. Mike – WOW…what a terriffic way to give back. Having said that, you will likely be enriched beyond belief from the experience. Best wishes for a safe and exciting journey. Hello! Thanks for … Hello! Thanks for this useful video. By the way, I notice a lot of people keep on talking about Mobofelax Forex System (just google it), but I’m not sure if it is good. Have you considered Mobofelax Forex System? I have heard several unlbaiveble thingsï»¿ about it and my mate earn lots of money with it, but he refuses to tell me Was this answer helpful? Michael – best of luck on such an epic undertaking, and awesome job supporting such terrific charities!!! I know that you’ve put yourself in the best position to succeed; the rest is in God’s hands. I’ll be watching and rooting all the way, and you’ll be in my prayers until you return safely.Have a great time, and enjoy the ride!! Mike! Can’t wait to hear about this adventure as you bike along Africa! Mike I’ll be checking in on your progress , have fun and be safe ! Safe travels, enjoy the gifts if the trips and your training. We will be following you all along the trail and keeping you in our prayers. Thanks Jer. Keeping the prayers coming. Thanks Kath. Have fun with the Derbs and Mary. I cannot find anything on the web site that says “follow me” or something similar. So am hoping a “reply” will get us connected to future emails etc. Glad to hear you are off to a good start. Godspeed Mike! So sorry that I’m unable to join you on this great adventure. I will however, contribute to the Living Room Ministries. Julie McGowan and her workers care for the dying poor with a love and compassion as real as Mother Teresa. Be safe. Thanks Greg. Wish you were riding part of the trip. It’s going to be a blast. Thanks Len. Some good pointers. Mike, you are awesome! Enjoying tracking you and hearing the stories. Sounds like the Oklahoma wind was a mere practice test for the real exam. Good luck. Thanks Paul. This ain’t BCC. Mike, being following your epic ride, sounds awesome. Keep sending the update. Be safe! Mike, Great cause! Be safe and God bless. Had dinner with Mary tonight. She couldn’t stop talking about you….soooo cute! Pictures are great (except for the beard 😦 Keep going and say your prayers!!!! Mary said she enjoyed dinner with yo guys and the Rienliebs. I think the beard might get trimmed for her. Good luck the rest of the way! Can’t wait to hear the stories! A torcida do Corinthians pode nÃ£o ser a maior mas se destaca pelo seu amor.Tenho certeza que vamos reverter esse placar,e ganhar essa Lieaotedrrbs. Tough question….I think people will have a hard time answering this! I suppose I managed to take regular showers. Everything else I think revolves around family (which is okay!). Now that I think about it, my family probably benefits from me taking regular showers too…oh well I’d Love this giveaway!! Thanks! Mike, Saying a prayer for you daily. Anxious to hear all about the journey. Trying to keep Mary well fed but she’s keeping herself pretty busy. Cheers! Thanks Clive. We all miss you. You are just entering the area we were in in March, Zambia. Botswana and South Africa; however our experiences were quite different than yours. You will LOVE Botswana when you get there. The people are so nice and I’m pretty sure the terrain will be nice and flat for you. Cape Town is awesome and should keep you motivated as the prize at the end of the trip. We had 5 days there and it wasn’t enough. Please be safe and get home in one piece so I can get a few bucks off you on the golf course. Love, Denise, Jace and family. Thanks Rog. I heard you and Donna had a nice dinner with Mary. Thanks John. You’re a good friend. Hobs: Welcome Home! Bet a hamburger, a milkshake, and a round of golf sounds good right about now! Thanks Gig. Hope to see you soon. Mike as I used to say whenever you made a putt as my partner it reminded me of the Bette song did you ever know your my hero what an accomplishment Hobes as always with your gang of great persons.